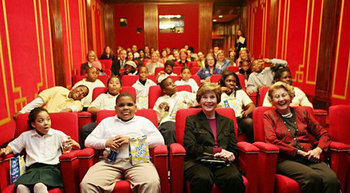 1 Caption: First Lady Laura Bush and her mother, Jenna Welch, with Washington, D.C., school children in the remodeled theater of the White House's East Wing. 2 What is it like to grow up in the White House? Few people will ever know. The rest of us can only imagine what it would be like to have a house full of servants, tons of perks, round-the-clock Secret Service protection, and constant media attention. 3 Presidents and First Ladies who have children in the White House are always careful to shield their children from the media. The result is that we know only a little about the lives of kids who grew up in the White House. 4 We know that the one hundred thirty-two room house has perks any kid would love, from an unlimited supply of M&Ms to a private, forty-seat movie theater with first-run movies. Then there is the tennis court, the bowling alley, and the pool. There are plenty of guest rooms for sleepovers and even a personal chef. In December, there are over a dozen decorated Christmas trees. Oh, yes, and presidents' kids get to meet celebrities all the time - sports stars, movie stars, and musicians, as well as world leaders. 5 Grown-up kids in the White House can enjoy an elegant lifestyle. President Nixon's daughter Tricia was married in a beautiful wedding in the White House Rose Garden. Four hundred guests attended.